On June 13 in Ginoza, Kuruto Aniya (right) shows a Ryukyu leaf turtle, which is designated as a natural treasure. He caught it on his way to school. 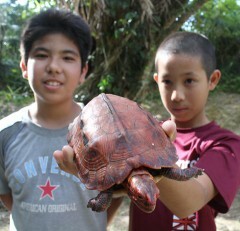 On his way to the school on May 31, eleven-year-old pupil of Ginoza Elementary School Kuruto Aniya picked up a Ryukyu leaf turtle (Ryukyu yama-game) without knowing that it is designated as a natural treasure. After being contacted by the school, a researcher of the Ginoza Museum confirmed that the animal is in fact a national treasure. “This is a quite beautiful turtle. Most of the turtles are brown or yellow. Even so, we don’t know whether it is male or female, this is a very beautiful red,” one of the museum staff said. After the turtle was given appropriate care in the museum, Kuruto and his friend Shuya Tokashiki released it in the nearby woods on the afternoon of June 13.